The following diagram explains how these dimensions compose the four prioritization categories and provide typical examples of tasks and the recommended action plan for each category. Matrix above is based on the following file from WikiMedia Commons. The application of the Eisenhower method is fairly simple provided you are able to commit yourself to making radical categorization of tasks. Take any task and first decide if it’s urgent or not. This will help you determine if it’s something for which you need to take some kind of action immediately or not. Then decide if it’s important or not. This will help you determine if it’s something you need to do yourself or if it’s something that you can delegate. 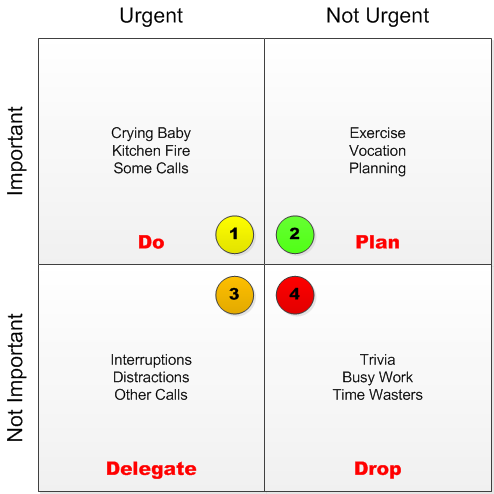 So Priority 1 tasks are tasks that are both urgent and important. These tasks need to be addressed personally and immediately. However, if you’re spending most of your time in these tasks, you’re just putting out fires. This is usually an indicator that you’re merely reactive and are not planning your work and your actions ahead of time. Priority 2 tasks are tasks that are important but not urgent. These tasks need to be addressed personally but not immediately so they need to have a planned date. Give them a start date and a completion date. This will help you build your activity plan/calendar. Ideally, most of your tasks should be priority 2 tasks. Priority 3 tasks are tasks that are urgent but not important, so they require immediate attention, but not necessarily by you. These tasks are usually other people’s priorities, not yours. If possible, delegate them, if not, move them to a Priority 4. Priority 4 tasks are tasks that are neither urgent nor important, so they are mostly a waste of time. These tasks should be dropped as they provide no value. David Allen’s Getting Things Done (GTD) technique is a very clean way to address not only a big backlog of to do items but also an overwhelming and steady flow of new tasks. However, I don’t find it always clear how to act upon a certain task. So, I find it easier if I categorize the tasks using the Eisenhower method before acting on them using the GTD framework. Priority 1 tasks (Important & Urgent) are done immediately (or moved to the Do List if you’re using an immediate action list). Priority 2 tasks (Important & Not Urgent) are moved to the Deferred List. Priority 3 tasks (Not Important & Urgent) are moved to the Waiting On List. Priority 4 tasks (Not Important & Not Urgent) are moved to the Archive. Even if we manage to spend most of our time working on Priority 2 tasks (the ideal), which means we’re planning our work and are working “strategically”, we can sometimes be overwhelmed by our daily lives and a sudden outpour of new stuff might cause our task list to get out control. That’s why it’s so important that these techniques are simple enough to be effective and simple enough for us to restart using them whenever things get out of control. Personally, I find that using these rather simple techniques (purists may argue that I use a very simplistic approach to these techniques, but I find that they are ideal for me from a cost-benefit perspective), I am generally more effective and in control of how I invest my time both professionally as well as personally. This is impressively awesome. I just implemented this on Asana as tags. Pretty good way to float in a sea of overwhelm.